We won! We’re delighted to say that Event Genius Pay, the cashless POS arm of our end-to-end cashless, ticketing and access control solution, has been named most ‘Innovative Product’ at the prestigious Ticketing Business Awards. At last week’s ceremony hosted at Emirates Old Trafford, Lancashire County Cricket Club in Manchester, our Cashless POS event solution, beat off worldwide competition at the industry leading conference from the likes of LISNR & Ticketmaster, as well as companies from USA, Belgium and Israel, to claim the trophy. Our entry, which detailed how our white-label end-to-end solution can increase customer spend by 10-25%, was judged by a panel of experts from a range of fields including Sports, Theatre, Live Entertainment, Cinema and more. 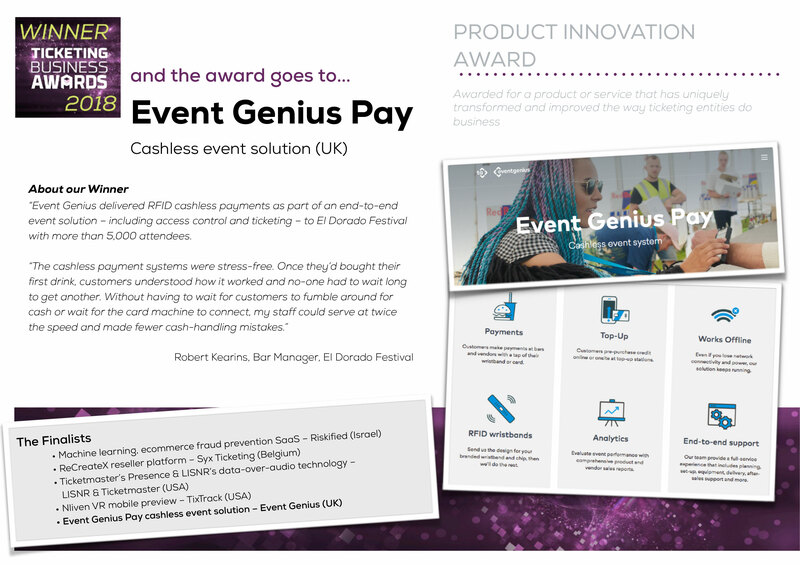 This recognition shows why Event Genius Pay is considered the UK’s number one cashless festival platform. We’d like to also offer our congratulations to the rest of the winners at this year’s Ticketing Business Awards and say a big thank you to the team at Xperiology for another fantastic event. Want to see what’s in store for the rest of 2018 and beyond? Get in touch with the team via email or telephone (+44 (0) 203 051 1244) to arrange a meeting.